The following was originally written here. All credit for the content of this post goes to TerrifiedOfGhosts, with only minor changes being made to reflect the difference in format. 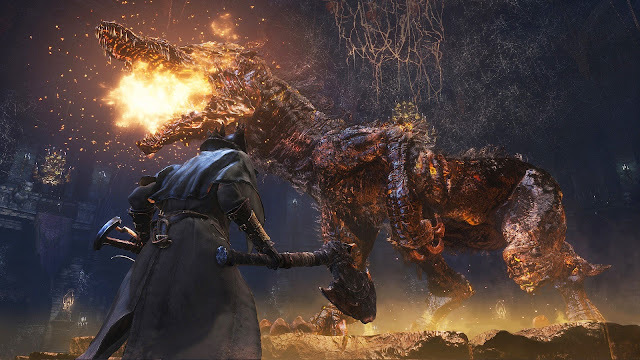 This article discusses the Pthumerians and what may have happened to them. I've been seeing a lot of lore posts on the Pthumerians lately, all of which have been very thought-provoking and well-reasoned. However, when it comes to the Pthumerians' obsession with blood and the Queen, they seem to be missing some very key points. As such, I thought I'd dust off some old thoughts I had regarding exactly that topic. In the beginning, there were the Pthumerians and the Great Ones. We don’t know conclusively which found the other first, but we do know that the Pthumerians worshipped the Great Ones as gods. As the Great Pthumeru Ihyll Chalice states, "early Pthumerians were mere humble guardians of the slumbering Great Ones." Oldest of these, according to the Bone Ash Set, were the Keepers of the Old Lords. Note the end of that epithet: "of the Old Lords." The Old Lords are obviously the Great Ones — but what makes them “old” lords? Are there “new” lords? Great chalices unlock deeper reaches of the labyrinth. Pthumeru Ihyll was the title of both the Pthumerian monarch and its capital. This reveals that while early Pthumerians were mere humble guardians of the slumbering Great Ones, their descendants felt entitled to name themselves a leader. According to the Pthumeru Ihyll Root Chalice, these monarchs were traditionally women: queens, like Yharnam. Guess who doesn’t have a Keeper of the Old Lords within three Chalice layers of her? Why were the Pthumerian monarchs only women? And why did the Pthumerians turn away from their "Old Lords" to worship the Queen? The inhuman beings known as the Great Ones imbued this Ring of Betrothal with some special meaning. In the age of the Great Ones, wedlock was a blood contract, only permitted to those slated to bear a special child. Only women can give birth! Thus, in a sense, the Great Ones would be the "Kings" (even those engendered as female), and these chosen women would be their Queens. These brides, including Yharnam, were specifically “slated” to bear the heirs of the Great Ones. So if old-fashioned coitus was out of the question, there had to be another way — the “blood contract” mentioned in the Ring of Betrothal! Now, if you’re wondering what a “blood contract” is, a great “real world” example of a blood contract can be found in the Hungarian Blood Oath. The blood oath (Hungarian: vérszerződés, lit. "blood contract") was, according to tradition, a pact among the leaders of the seven Hungarian tribes, traditionally held to be the first, unwritten constitution of the Hungarian nation. Its story, along with the terms agreed upon in it, is mostly known from the somewhat unreliable Gesta Hungarorum, a chronicle written between 1196–1203 and is thus possibly influenced by 12th century laws and customs. The oath was sealed by the seven leaders – Álmos, Előd, Ond, Kond, Tas, Huba and Töhötöm – by cutting their arms and letting their blood into a chalice. This practice is likely to have been used traditionally to seal exceptionally strong oaths, and there must have been several similar oaths, but the phrase "blood oath" usually refers to the one by the seven leaders. In some versions of the tale, these seven chieftains sealed the deal not only by intermingling their blood, but by putting the filled Chalice to their lips and drinking the concoction. Yum! Coming back to Yharnam, this “blood contract” would be what the Healing Church calls “Communion,” or blood ministration. Several runes relate to "blood", including "Communion", which raises the maximum number of blood vials one may carry. This rune represents the Healing Church and its ministers. Blood ministration is, of course, the pursuit of communion. Ritual chalice found in the Church of the Good Chalice. Use in a ritual at the tomb altar in the Hunter's Dream to break the seal of the old underground labyrinth. Let the chalice reveal the tomb of the gods; let blood be the hunter's nourishment. The Pthumerian Queen would drink the "Old Blood" of a Great One, most likely using a Chalice. That blood would impregnate the Queen, and she’d give birth to an infant Great One. But that doesn't necessarily explain why the Pthumerians forsook their “Old Lords” to follow their Queens, does it? The Queen, after all, could arguably be considered a mere vessel for divinity, and not necessarily divine, herself. Rather, I suspect that there's another piece of the puzzle; a horrifying twist to the formula that, over time, made the Pthumerians revere their Queens more and more in their own right. Because she wasn’t just their ruler… she was their mother. Or would be. Let’s step back for a moment. How does the "Old Blood" impregnate women? By what mechanism does it implant a fetus within a human womb? We know that the Great Ones are beings of boundless insight. We know that their very thoughts can shape reality. So… could that mean that their blood contains traces of their own consciousness? The bloody memories of those cursed by the plague of the Beast. And what are these “bequests of blood”? These dying wishes of the beings you’ve ruthlessly slain? The "Heir" sees sentimentality in the warmth of blood, acknowledging this as one of the darker hunter techniques. More Blood Echoes gained from visceral attacks. Perhaps the "Heir" is a hunter who bears the echoing will of those before him. This is the desire of every “living” thing: to pass along their consciousness. To have a child. A child, in turn, is the consciousness of both its parents. It is both of its parents, continued, because it is the offspring of their blood. Every time you kill something and absorb its blood, you become its “Heir.” In a sense, you are its child. Every Great One loses its child, and then yearns for a surrogate. Now we can understand the nature of Pthumeru’s terrifying rituals. The Great Ones’ consciousness can shape reality, and all of them yearn for an heir. Just like every other thing with blood consciousness. Then might Great Ones’ Blood Consciousness + Pthumerian Blood Consciousness + Queen’s Body = Great One Baby also be true? One of the basic ingredients used to satiate a Holy Chalice is this incoagulable blood. This explains the Chalice Dungeons’ hanging dead men, their giant pools of blood, their ceiling-high stacks of dead pigs… and also, why there are so few Pthumerians left. Because they were killing themselves. Sacrificing themselves to become “one” in blood, and then (theoretically) reborn, collectively, as an infant Great One. Horrifying, isn’t it? The things men will do to become “more” than what they are?